Chris is involved in many performances and shows throughout the year, as well as teaching an adult choir class in Midorigaoka twice a month http://www.voices-chorus.com/ (open to the public). Please come out and support him as he gives his gifts of music, teaching and song. BNV Studios Warm-up Exercise CD – Now you can warm up on the go! 8TH Annual Student Recital photos available NOW on the studio Flickr page as well as the video on our YouTube channel. Check it out, and please SUBSCRIBE! Body N Voice is also on TripAdvisor! Chris Levens, has done it again. Welcoming you to the Fridgeezoo Q! That’s right, you just sit this animal in your refrigerator, when you open the door and the light hits it, it speaks. The voice of the lion is none other than Chris Levens himself. You can get your own Fridgeezoo Q on Amazon nationwide, Village Vanguard or Tokyu Hands stores. Follow the link below. Chris Levens and four singers sing back up for this new educational commercial. Sponsored by Kyocera Japan. The Title is “Perfect Synergy”. 12/4 Doors open at 2:45PM, show starts at 3PM. Ticket cost is ¥4,000 w/ 1 drink ticket. Kids 12 and under half price. Purchase the latest music releases by Chris Levens. Click the links below to take you right to iTunes for purchase. BNV Studios thanks you for your constant support. Pictures from 2014 Junior Recital here! Pictures from BNV Annual Student Recital 2013 here! On Saturday May 14th at Ako's Studio in Harajuku, Tokyo. Doors open at 1:45 P.M., 2 P.M. start. ¥3,500 with drink ticket. Kids 14 and under are half price. 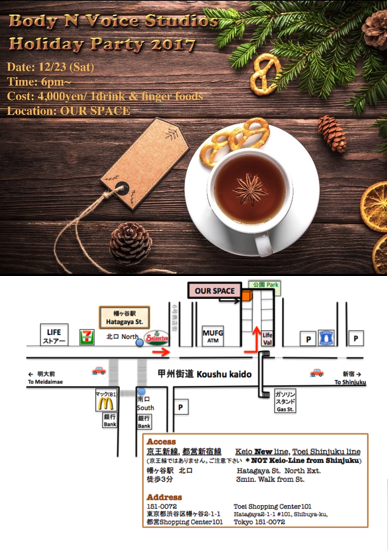 Date: December 6th, 3pm at Our Space in Hatagaya North exit. Come and enjoy an afternoon of musical scenes from Wicked, Into the Woods and Sweeney Todd. Watch an interview with Chris on YouTube! Contact: bfashens(at)gmail.com for more information. JT (Japan Tobacco) does many things. Take a look at the CM with Chris Levens. Benesse World Wide Kids Global Holiday Show! Yamaha's new speakers for the future. Promotional video starring Chris Levens. Come out and enjoy an evening of music! Sponsored by Sony Ericsson, RE;mind is a mystery thriller. It's Saw meets Agatha Christie at a dinner table. Original story by Yasushi Akimoto, directed by Keisuke Toyoshima. Watch RE;mind on the new Sony Ericsson "Android" phone Xperia. Watch the preview, starring Christopher Levens, here! Body N Voice Studios Presents H.E.R.O.